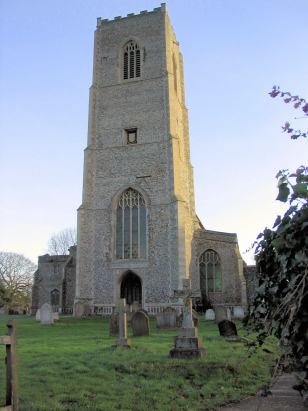 The parish of Carbrooke sits in Central Norfolk and lies a couple of miles north-east of the market town of Watton and north of the B1108 which connects Watton to Norwich. The village lies in a small valley fed by the outlet from Scoulton Mere. A north-south lane bisects the valley and the bulk of the village is spread along two further lanes on the south bank. 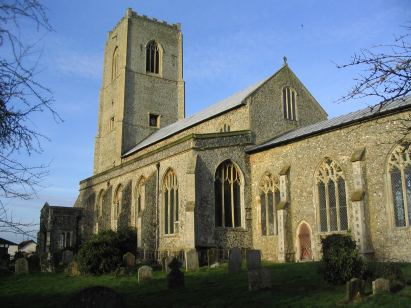 The parish is large, for Norfolk, and is characterised by flat agricultural land, in particular to the north-east of the village where a large tract of land is unusual for Norfolk in being road-less. The church of St Peter & St Paul is dominated by its tall tower at the western end and is in the main typically Perpendicular. It lies in a pleasant churchyard just north of the brook and in the heart of the village. Pevsner speculates that its similarities to Blickling and St Giles in the city of Norwich indicate a shared architect if not constructor. In the grounds of the churchyard there are strange earthworks which are the remains of a Knights Hospitallers Preceptory. There are two registers deposited covering the period of the transcription, The first is filmed on microfiche 9 & 10, the second is on microfilm MF/998 and is a later deposit. Both sets of records are early filming and are not of the quality of more recent efforts being faint and lacking in contrast. The quality of image recently loaded to the LDS Familysearch website is of a far superior quality to that in NRO. The films are, however, sufficiently good that a clear and legible entry is available for the majority of entries so it hoped that on this occasion few errors have crept in to what was a straightforward transcript to prepare.